One of the most common misconceptions about lung cancer is that you can get it only if you smoke or used to smoke. However, the American Cancer Society states that as many as 20% of the people who die from lung cancer in the United States every year have never smoked or used any other form of tobacco. Lung cancer is the leading cause of cancer deaths in both men and women. Though lung cancer is not typically considered a “male disease,” it is true that more men than women contract the disease. Roughly 1 in 14 men will be diagnosed with lung cancer, while 1 in 17 women will be. So what should you know? As mentioned previously, nearly 20% of those who die from lung cancer in the U.S. have never smoked or used any form of tobacco. This equates to approximately 30,000 lung cancer deaths of nonsmokers in 2017. There are several risk factors that contribute to these cancer diagnoses, including but not limited to radon gas exposure, secondhand smoke exposure, and air pollution. Symptoms may be hard to spot or nonexistent early on. There are different types of lung cancer. 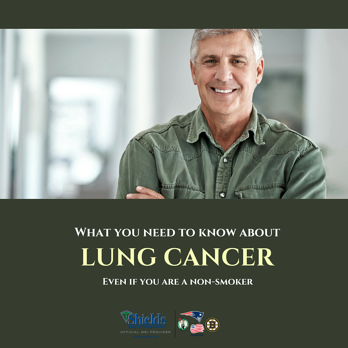 Also known as NSCLC, this is the most common type of lung cancer; roughly 80% to 85% of all lung cancers are non-small cell cancer. This is commonly found in current or former smokers. Also known as oat cell cancer, this affects 10% to 15% of those diagnosed with lung cancer. This is a fast-spreading cancer. Only roughly 5% of those diagnosed with lung cancer have this type. This tends to be a slower-growing tumor that rarely spreads. PET/CT (positron emission tomography/computed tomography) is the most common method of screening for lung cancer. It combines PET’s ability to detect changes in cell activity with the fine structural detail that CT scans provide. This technology enables your physician to detect the presence of disease earlier and to pinpoint its location with much greater accuracy than PET or CT scans alone, enabling a more targeted treatment. Shields Health Care has several locations throughout New England that offer PET/CT services.